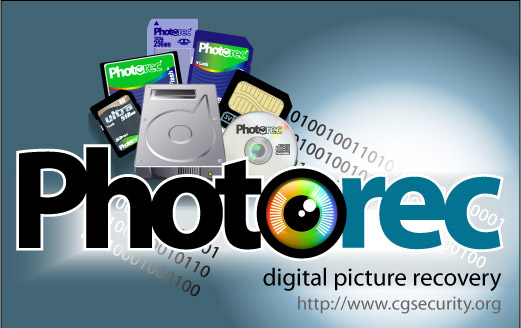 PhotoRec is a free software provided by cgsecurity for recovering data, files, video, audio and any other electronic data which are lost. PhotoRec which is an abbreviation for Photo Recovery can also be used to recover Photos stored in electronic form in a digital camera. The usual format for storing files / data in electronic form are CD-ROMs, hard disks, Pen / Flash drives, HDD etc. PhotoRec software can be used in all the above formats to recover the lost items including from the memory of your digital camera. PhotoRec is such a powerful recovery software that it even works on file systems which are reformatted or highly damaged as the software searches for underlying electronic data rather than searching the existing file system. As already mentioned PhotoRec is a open source software whose distribution is under GNU or General Public License – GPLV v2+. This software works on multi platform. This PhotoRec software has a mate program viz., TestDisk which is an application software used to recover partitions in the lost data file systems. This TestDisk application is also used for converting the non bootable disks in to a bootable one. For better results in using the PhotoRec software, it is advised not to add or save more data or file or photos once you feel the previously stored ones were lost accidently or intentionally. PhotoRec software access the file system or memory card or drive where from you want to recover the lost data only through read only method. If you are not repeatedly overwriting on your lost data, the recovery through PhotoRec will that much be easier. It is also better to store or write the recovered data in a separate partition or file system apart from where you recovered the lost data. Generally the PhotoRec software searches all known file extensions. PhotoRec can recover the whole file in most of the cases where there is no fragmentation of data. PhotoRec can recover file formats of more than 390 file extensions belonging to 225 file families. Some of the file formats the PhotoRec easily recover are graphics file formats, JPEG, HTML, PDF, Office, ZIP etc. The most known files systems like ext2 / ext3 / ext4, NTFS and FAT store the electronic data like files or photos or audio or video in clusters or data blocks. When a file system is formatted they are constituted in to sectors and the above referred clusters or blocks remains at constant No. of sectors. Most of the Operating Systems try to store any data in a continuous or contiguous manner just to minimize the data fragmentation. This in turn reduces seek or search time of drives for writing or reading data from / to a hard disk. The major or meta information of a file like size, date / time, name, location of the cluster or data block are also lost when a file is lost or deleted. However, the data of the file is still present in the file system till the cluster or sector is overwritten by some other / new data. Then, the PhotoRec software tries to find the cluster or data block in the file system. If the same is not corrupted, the file value can be had from volume boot records in case off NTFS, FAT file systems and from the superblock in case of ext2 / ext3 / ext4 file systems. If the above rule fails, PhotoRec searches the media for the first ten files, sector by sector from their locations by calculating the location of cluster or block. During the recovery of lost data, the software tests the consistency of file and saves the same as a new file. Usually, the recovered file / Photo will be same size of the Original file / Photo or slightly larger than the original. After the complete recovery, PhotoRec tests for a comparison of lost file from its location in the file system and completes the recovery. PhotoRec can also recover fragmented files. Here is the link to download the PhotoRec software along with TestDisk application. No doubt, PhotoRec is an excellent software application to recover all your electronic data including Photos, Video, Audio etc. Why don't you try it in case you need it?